Whatever else you can say about Dinosaurs On A Spaceship, it cannot be denied that it does deliver on it's rather fantastic title. We do indeed get dinosaurs on a spaceship. We also are treated to the Egyptian queen Nefertiti, a big-game hunter, the prissiest pair of robots this side of Star Wars and the most gleefully evil villain Doctor Who has had in quite some time. This is easily the best new episode in quite some time to use as an introductory episode for potential Whovian recruits. The year is 2367. 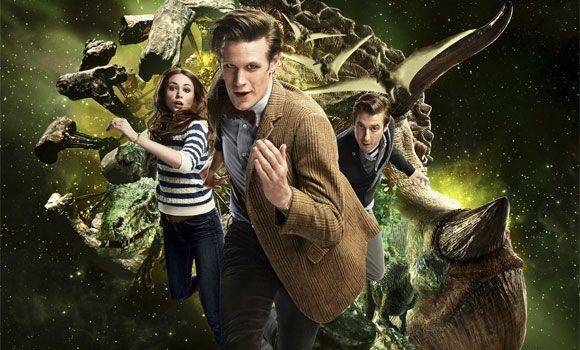 Called into action by the Indian Space Agency, The Doctor and his current companion (Queen Nefertiti) are informed of a mysterious spaceship approaching the Earth. Unable to offer any intelligence about who the ship belongs to, the ISA plan to destroy the ship with missiles unless The Doctor can find some way to divert the ship. Deciding that it might be nice to have a full team for this journey, The Doctor makes two side trips to pick up some old friends. The first trip snares John Riddell - a big game hunter from 1902. The second trip grabs Amy and Rory Pond along with Rory's dad, Brian Williams. The six of them land on the mysterious spaceship, finding it mysteriously full of dinoaurs...and no other life. Who did the ship belong to? Why is it full of dinosaurs? HOW is it full of dinosaurs? And what is to be made of the wounded man named Solomon, whose heart lies docked in the ship of the mystery space ark? * The dinosaur effects are phenomenal for the budget Doctor Who usually has, easily being on par with the later Jurassic Park movies. * This episode had a great cast of fairly famous guests fleshing out the ensemble. You have Mark Williams (a.k.a. Petersen from Red Dwarf) as Rory's Dad. You have Rupert Graves (a.k.a. Inspector Lestrade from Sherlock) hamming it up gloriously as John Riddell. And just when you think it can't get any better, you get bloody David Bradley (a.k.a. Mr. Finch from the Harry Potter films) as the wicked slaver Solomon. * Matt Smith gets a great moment in this episode during his final confrontation with Solomon, in which we get to see something we've seen far too little of during Smith's tenure - a truly enraged Doctor. We've seen Smith get angry in the face of evil before but there is something far more intense this time around - on par with David Tenant's reaction to the villain's plan in The Runaway Bride - as he confronts an irredeemable slave-trader/poacher who was willing to commit genocide for the sake of a profit. * There's also a magical moment near the end, as Brian Williams eats his lunch looking down upon the Earth he just saved while sitting in the doorway of the TARDIS. It's obviously meant to invoke the old images of the steel-workers who ate on girders several thousand feet above the city they were helping to take into the stars and it does so quite effectively. This is the kind of image that examplifies everything Doctor Who can be. * Matt Smith gets another great moment here, so short you could blink and miss it. As Brian enjoys his lunch and his view, Amy and Rory come up behind him and take in the sight of this common man enjoying something miraculous that is - in the face of some of the things they've done - so mundane. And yet, they still share that moment. And then The Doctor comes up behind them to do the same thing... and looks uncomfortable for a moment as he realizes he's intruding on some personal family thing he's not comfortable being part of. * While the guest stars do a good job with what they are given, the characters are surprisingly shallow. John Riddell is your classic macho pulp hero and Queen Nefertiti is the typical proud princess. You couldn't have made their eventual fate any more obvious if they had been named Han and Leia. * For that matter, there's not a lot of detail put into Brian Williams as a character apart from him being far handier than his son and being the sort of man who carries tools on his person "just in case" he needs a trowel. The episode could have used a little more time to flesh out the relationship between father and son, if only to make their piloting a spaceship together more powerful later on. Dinosaurs On A Spaceship not only manages to live up to the promise of its' goofy title - it surpasses it. What could have easily could have been a one-off episode done purely for laughs is made into something far better by an amazing ensemble cast of guest actors. This episode can easily stand alongside Blink and The Empty Child/The Doctor Dances as a great episode to show to somebody who has never seen Doctor Who as an introduction to everything the show can be.